This page will guide you to increase the size of system partition on Windows Server 2003 R2/SBS without reinstalling operating system. Download IM-Magic Partition Resizer Server to extend system partition when lacking free space on Windows 2003. Are you wondering is there any way to extend the c drive without reinstalling OS on Windows Server 2003 (R2/SBS included)? In fact, the problem can be resolved by using partition software IM-Magic Partition Resizer Server. This partition software is able to resize hard disk including the system partition without repartitioning hard disk, no reinstalling system nor touching any data on the disk. It also has 100% no influence on the operating system. Download, install and run IM-Magic Resizer Server. Right click a large partition to shrink some space. When mouse shows double arrows symbol, you can move the arrows to shrink the selected partition to squeeze some unallocated space. 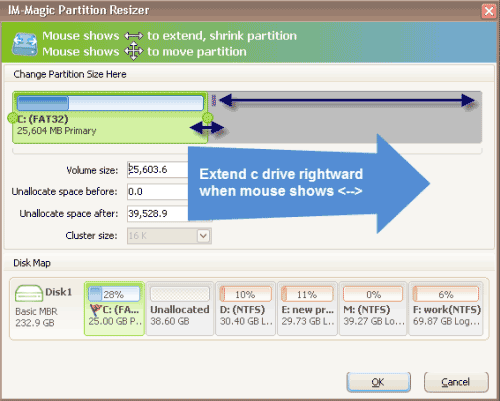 Use "Resize/Move" option to adjust partition space from one to another. "The C drive runs on low disk space on Windows Server 2003. Can I increase the size of C drive without reinstalling the operating system? The Windows Server OS is installed on this drive, so I am afraid that it will cause damage to operating system due to improper operation on the C drive. Can anybody tell a reliable method to fix low disk space on system partition on Windows Server 2003?" IM-Magic Partition Resizer Server allows you to extend the system partition space with no influence on operating system or disk data, but you can only move free space from other partition (s) on the same hard disk. 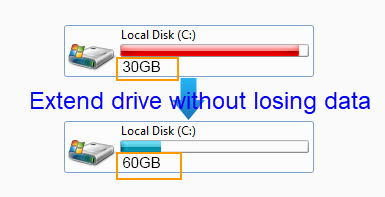 In other words, free space on the same hard disk is always needed in order to extend system partition. If there is no free space on all partitions on the same hard disk, you cannot extend the system partition by adding a new hard disk. Adding new disk should be built with RAID to get the free space to c drive.